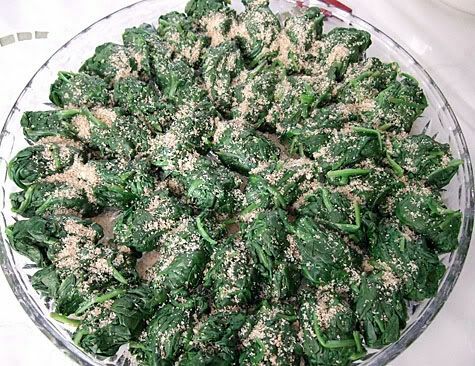 I was very pleased to hear that my aunt Tomiko had invited us over for Oshotagsu, the traditional Japanese new years celebration, because she has always been a generous and ambitious hostess, usually going miles beyond the average effort for any feast. The first day of the new year is one of the most important Japanese holidays symbolizing endings and new beginnings. In fact they begin the celebration at the stroke of midnight on New year’s Eve by listening to the tolling of the bells or gongs for 108 chimes at a local Buddhist temples. This ritual is a way to send out the old year and usher in the new and to pray for a prosperous and healthy new year. The 108 chimes is supposed to release people from the worldly sins. It is also considered a time of forgiveness and cordiality to all. 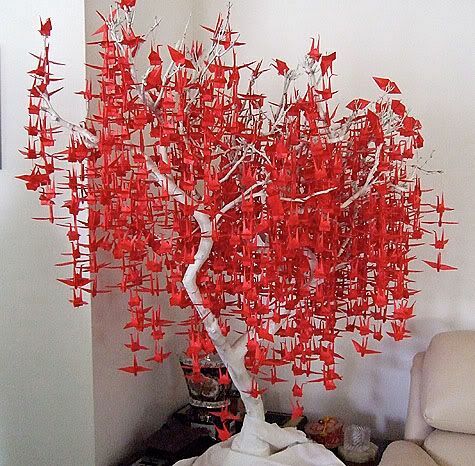 The tradition dates back a thousand years and is bursting with symbolism: cranes represent longevity and happiness, red and white are considered the most auspicious and cheerful colors. Ask anyone of Japanese descent about it and just about everyone enjoys a cup of Ozoni (mochi soup) to celebrate New Years day. 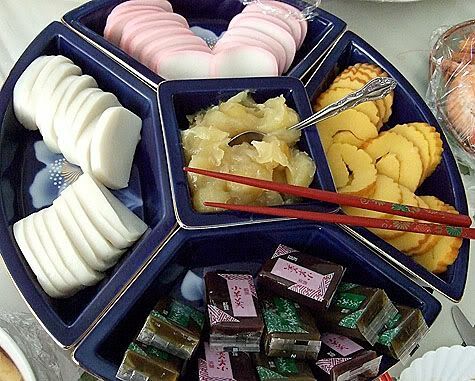 Mochi is made from steamed sweet rice, which is very sticky and is pounded until it forms a thick mass then is formed into small rounded shapes or cut into squares. It is revered in Japan and frequently used as a religious offering at shrines and altars, generally as part of a pyramid of tangerine-decorated mochi rounds that represents purity, abundance, or good luck. 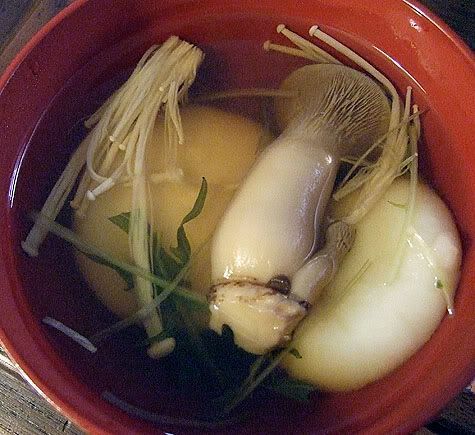 I always look forward to Ozoni and think it is sheer heaven to sink your teeth into the soft, round pillows of mochi floating in the steaming and fragrant clear soup. I like it best when the mochi has been cooked enough that it becomes soft and stretches when you take a bite from it. 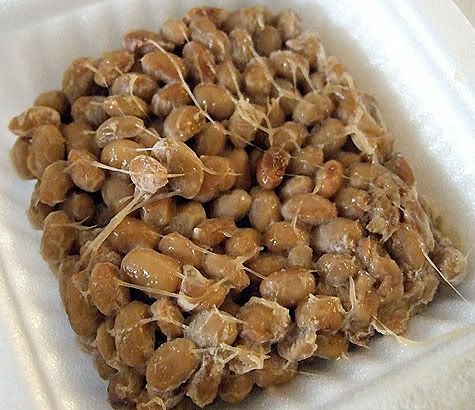 Natto, fermented soy beans, is a traditional dish with many health benefits but is definitely an acquired taste. I love gooey, slimy foods and this takes it to another level that with its distinct aroma of old gym socks. You really have to approach this in the same manner as with stinky cheeses. Anyways, the beans are soft and creamy and held together with a fabulous slime that stretches sinuously when you pull up a bite towards your mouth. A lot of people eat it mixed in with a raw egg over rice, but it’s divine slurped up with the soft and sticky mochi cakes in Ozoni. 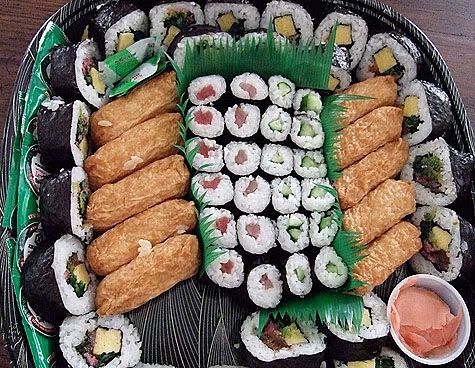 A traditional sushi roll plate of Futomaki which has egg, spinach, dried gourd, barbecued eel and shiitake mushrooms rolled up in it, Inarizushi (or footballs), which are rice filled tofu sacks and then some small rolls filled with with cucumber and maguro tuna. Sashimi Plate also from Nijiya market had salmon roe, salmon, pickled mackerel, maguro tuna, octopus and yellowtail tuna or hamachi, decorated with festive red and white plastic blossoms. Namasu in the center is pickled daikon radish and carrot embody the celebratory colors of red and white against the muted earth tones of the simmered root vegetables or Nimono. 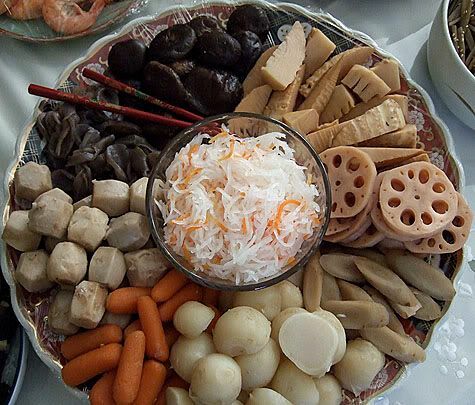 Starting at the top left are shiitake mushrooms, bamboo shoots (takenoko), lotus root (renkon), gobo (burdock root), potato, carrots, satoimo (taro) and konnyaku (devil’s root jelly). These are all lightly seasoned so not to interfere with the clean flavors of each vegetable. 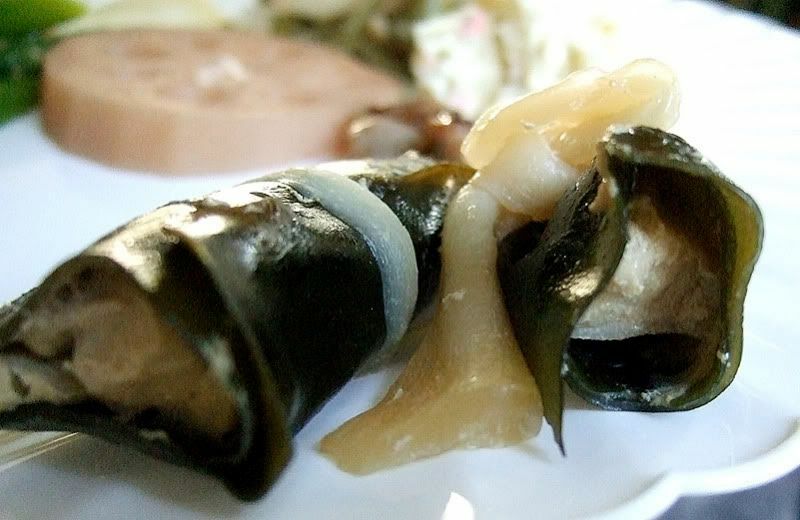 Konnyaku, is a gelatinous cake made from the starch of the “devil’s tongue” plant (a relative of the sweet potato). 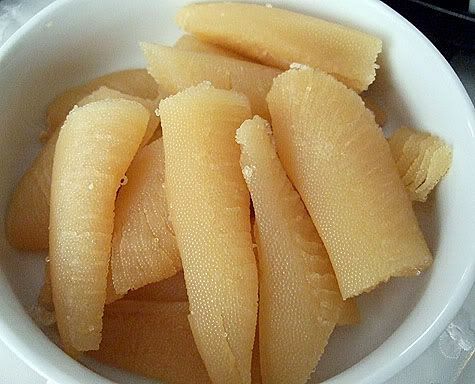 It has very little flavor but has a distinct characteristic texture (like tough gelatin) and kind of looks like a devil’s tongue. 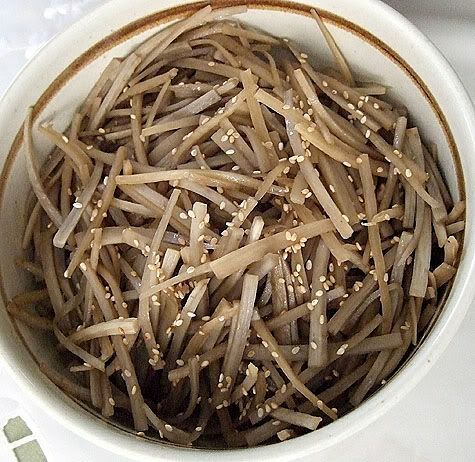 Kimpira Gobo, Burdock root symbolizes strength and has a distinct earthy flavor. It is peeled and cut into thin julienne slices, then sauted with some sesame oil, sugar and soy sauce and some red chili flakes. 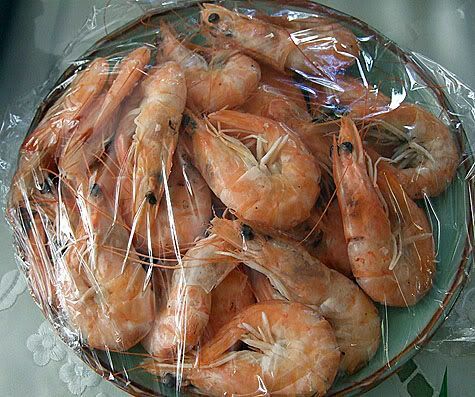 It has a dense crunchy texture and makes a wonderful condiment, especially with the simmered vegetables. Kazunoko, prepared herring roe, symbolizes the hope of having many children. Despite this symbolism, it is one of my favorite things to nibble on, probably because it has a very strong salty marine taste and a dense crunchy texture that crumbles apart when you bite into it. 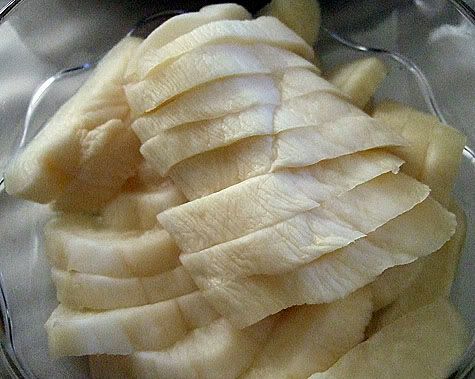 Takuan, Pickled Daikon Radish, has a thick crunchy chewy texture with a sweet, salty flavor that includes wonderful horseradishy fumes. Notice the abundance of strongly flavored pickles which add a much needed flavor boost to the many mildly seasoned dishes. 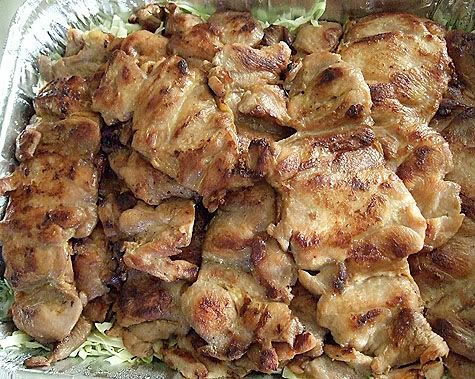 Teriyaki Chicken from Hawaiian Drive Inn!! 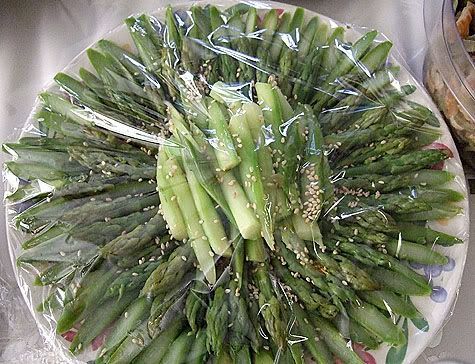 Asparagus, look at how much effort is given to the beautiful presentation, Tomiko is such an artist! Kamabuko, or fishcakes have the color and shape reminiscent of the rising sun, and combine the celebratory, festive colors of red and white. In the center is Kurikinton, mashed sweet potato with sweet chestnuts symbolizing having a sweet year, on the far right is Datemaki, which is a rolled egg omelette that is made with a sweet fish paste, and the plastic wrapped squares are jellied sweet bean paste. It was a fabulous feast that included grilled rib-eye steaks, steaming hot green tea, hot and cold sakes, and ended with coffee and sponge cake. Mr. K remains unimpressed with the traditional dishes as they are for the most part rather bland, but he seemed quite content to pick at the sashimi and sushi platters and has developed a liking for Ozoni over the years. 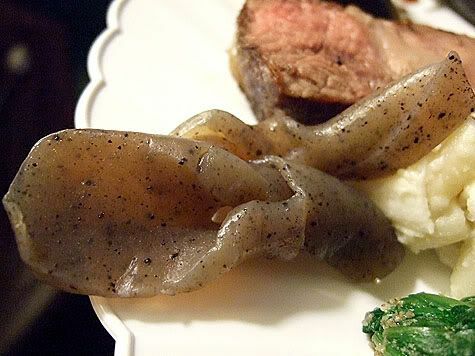 While the dishes are very traditional to the Japanese, I think that these are the most foreign to the western palate and don’t think I’ve ever seen them offered on a restaurant menu. Since I have been eating osechi ryori from childhood, I love the familiar flavors and look forward to the New Years feast. Looks delicious! Thanks for this post. I can never understand people thinking Japanese food is bland, but to each his own. My favorite is the tazukuri (the little candied, sweet/salty fish), and all the nimono. Oh man.. this looks so delicious. 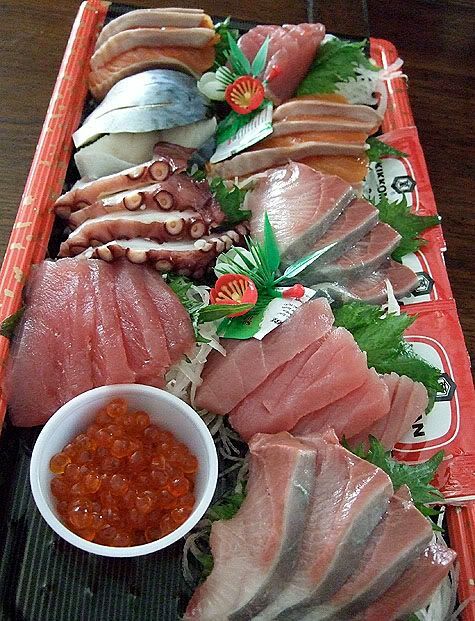 The sashimi platter and the natto look especially tantalizing. Thanks for sharing! Happy New Year Foodhoe! 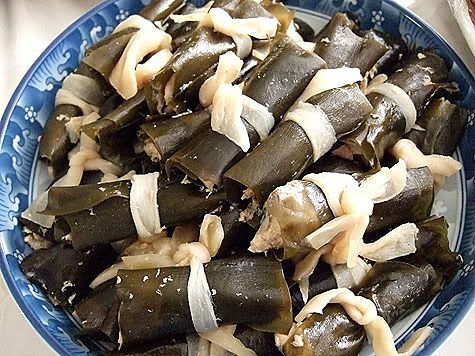 Thanks for all the explanations about the symbolisms behind each traditional new year food item. Hmmm, I wonder what’s the symbolism behind the teriyaki chicken from Hawaiian Drive-Inn? 🙂 Looked good either way! Everything looks delicious, except I personally can’t stand natto. What a wonderful way to bring in the new year! #1 (my what a long name you have! ), I love those little fishes too. It was very warming for the soul to do a traditional feast, it had been years. Rosa, my cousin Henry made the tree, I agree it is stunning. taste tester, the natto was a special stinkfree variety for beginners.